Supporting Prisoners and Acting for Radical Change (SPARC) is pulling together to raise funds to get folks to visit incarerated loved ones at Red Onion State Prison and Wallens Ridge State Prison. Due to the fact that these prisons are so far away, it is nearly impossbile for family and friends to visit. Together we can raise funds we need to buy a van, and we need your support to do it! SPARC has been renting a van every couple of months to make these rideshares happen, but it has now become a regular enough event that it just makes more sense financially to purchase a 15 passenger van and use that for these trips. Owning a van will also allow SPARC to possible expand the rideshare program, or offer rides for members and supporters to various other related events and meetings. Any funds that are raised above and beyond the purchase price of the van we buy will be put towards the insurance and registration and fuel for these trips. victim´s of the FBI´s Harrassment. of good updates on many political prisoners. Prisoners at Three Facilities in NC Begin Hunger Strike! Solidarity Needed! would like to sign on, please let us know. prisoners have vowed not to eat until their demands are met. that the strike has spread to three at least three different facilities. library is needed to enable us to legally defend ourselves. 2.An immediate end to the physical and mental abuse inflicted by officers. 3.Improve food, in terms of quality and quantity. over an hour. At least one prisoner has died this way. July Political Prisoner’s Birthdays Poster- Please Write! 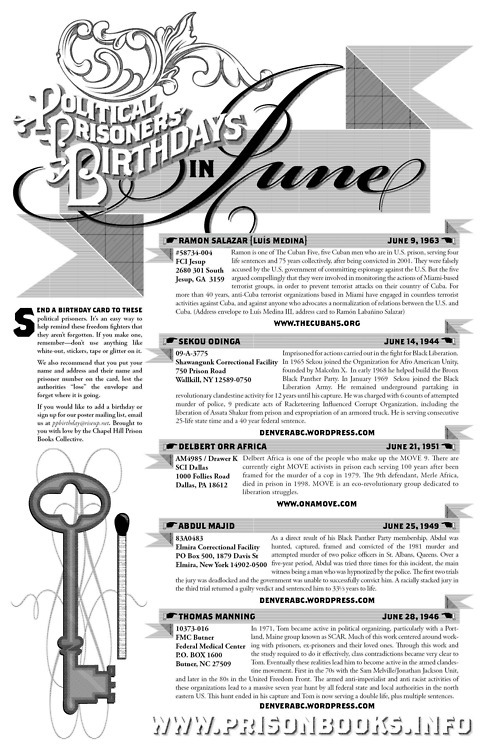 From the Chapel Hill Prison Books Collective, here is July’s Political Prisoner Birthday Poster, as well as links to a couple other rad publications. Download the poster and write prisoners, or come by the Wingnut to pick up a hard copy! June Political Prisoners Birthday Poster- Write a Prisoner a Letter! If you would like help with learning how to write a letter to an inmate, please feel free to contact the Richmond Anarchist Black Cross at 804 303 5449, rvaabc@gmail.com or come to a monthly meeting on the 2nd Tuesday of each month at 7om at the Wingnut Anarchist Collective at 2005 Barton Avenue. Much thanks to the hard workers of Internationalist Prison Books in Chapel Hill, NC for producing this resource each month. Take Action to Support Red Onion Prisoners on Hunger Strike- Call and Email Today! Make four phone calls today. Send four emails today. I’m calling to express my support for the hunger strikers in Red Onion State Prison. These several dozen men are on hunger strike to call attention to inhumane conditions at Red Onion, demanding basic rights from fully cooked meals and medical attention to sanitary living conditions and an end to solitary confinement. We demand that (the Governor/Director/Warden/Operations Chief) take action immediately to respond to their demands. Red Onion has a long history of public scrutiny for conditions, and we, the broad movement to support the Red Onion hunger strikers, won’t let up until their demands are met, and that Red Onion guarantees that there will be zero retaliation on the hunger strikers. I’m writing to express my support for the hunger strikers in Red Onion State Prison. These several dozen men are on hunger strike to call attention to inhumane conditions at Red Onion, from fully cooked meals and medical attention to sanitary living conditions and an end to solitary confinement. I have included the prisoners’ demands below. We demand an immediate response the strikers’ demands. Red Onion has a long history of public scrutiny for conditions, and we, the broad movement to support the Red Onion hunger strikers, won’t let up until their demands are met, and that Red Onion guarantees that there will be zero retaliation on the hunger strikers. We (Prisoners at Red Onion State Prison) demand the right to an adequate standard of living while in the custody of the state! Tuesday May 29th at 8pm at 1300 Bainbridge Road on Richmond’s southside. Facilitated by Jeff Winder. On Tuesday May 22 as many as 45 prisoners at Red Onion State Prison, comprising at least 2 segregation pods, will enter the first day of a hunger strike protesting deplorable conditions in the prison and ongoing abuses by prison staff. For the men participating in the strike this is their only recourse to get Red Onion warden Randy Mathena to officially recognize their grievances and make immediate changes to food, sanitation and basic living conditions at the prison. Gather with us in Richmond and show solidarity for the struggle of these courageous men by writing letters to state officials in support of the Hunger Strikers and their demands. We’ll provide all of the materials – paper and envelopes, stamps, talking points, sample letters and addresses. We’ll also put out some refreshments and look forward to talking with you about what else we might do in Richmond to offer support. These men are organizing at great personal risk to themselves and and it’s vitally important that prison officials know we are watching! For more information including a list of the demands visit the website of SPARC (Supporting Prisoners and Acting for Radical Change), the group that is in direct contact with the Hunger Strikers and is coordinating the support on the outside. this group includes former prisoners in VA supermax prisons, families members of current prisoners and allies. 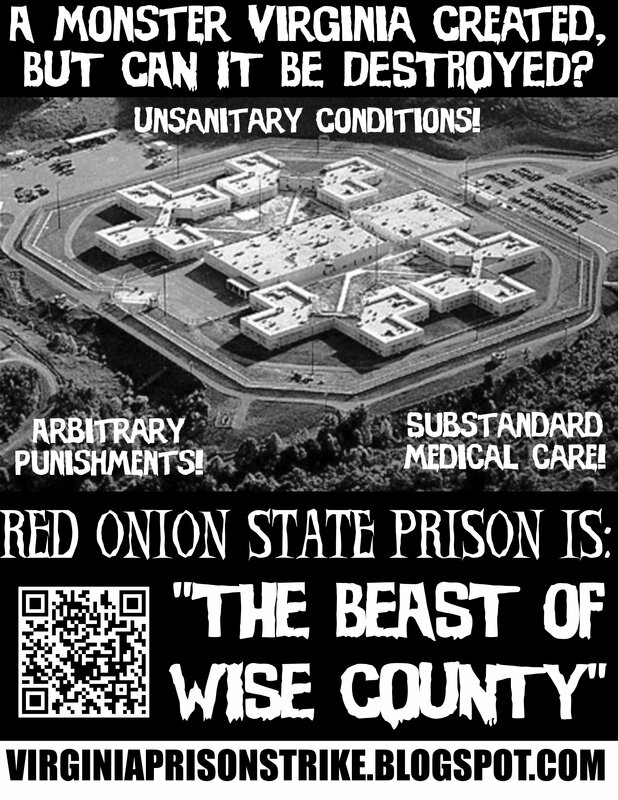 Flier in Solidarity with Red Onion Prisoners on Hunger Strike!